The most effective email campaigns are the ones in which most users actually open and read your emails. If recipients learn that they can expect something enjoyable from you, the chances of that happening increases. When it comes to marketing, one of the most effective tools you can use is humor. Just consider the ad campaigns that have remained memorable over time. Many of them used humor to connect with audiences. This technique also works for email marketing. If you can make your subscribers smile, you not only improve the open rate but also build loyalty. The recent MarketingSherpa Customer Satisfaction Research Study found that 17% of customers unsubscribe from the email lists of companies just because the content is boring and not interesting to them. 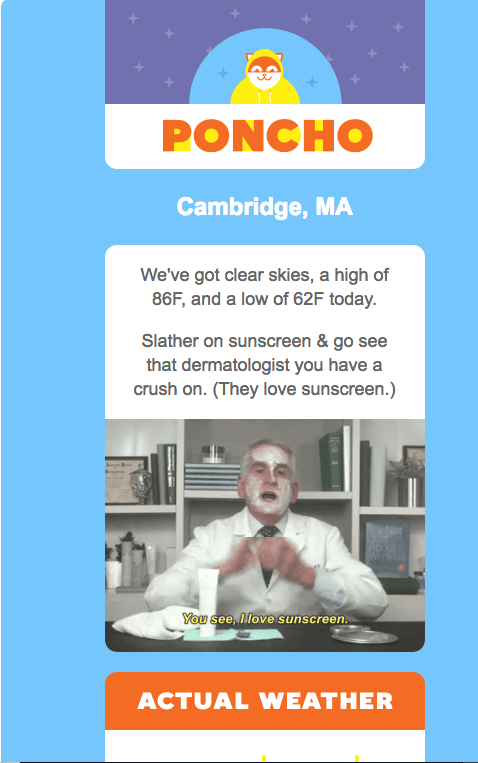 If you can leverage puns and jokes in the email campaigns, you get an advantage over your competitors. Of course, the challenge is using humor in ways that work. Here are six droll examples of doing just that. Visuals cause 50% of your brain to become active. In addition to this, 65% of people who were exposed to information with a visual remembered it three days later. Without the visual, that number dropped to 10%. Clearly, visuals are attention-grabbing and memorable. In addition to all this, visual humor simply connects with audiences, and it always has. If anything, that has only increased in these digital times. Today, people and brands share funny videos, GIFs, and memes as a way to express and evoke emotions. A great visual gag can also contribute to the overall look and feel of an email. One example of this is Poncho. They sent subscribers customized, weather forecasts via email. Each email was done in infographic form, and full of witty content. Sometimes, it’s best to play it a little safe when it comes to humor. Depending on your target audience, you might want to pick gags that go over well with a wide audience. Familiar humor tends to be popular, familiar, and safe. Basically, these are the jokes you would be safe telling at a family dinner or at work. One-liners, dad jokes, and clean gags all apply here. Familiar humor also evokes feelings of nostalgia. It makes them feel sentimental. There’s value in that because it provides people with an often desired break from adult, topical, or dark humor that often dominates. Sometimes, people enjoy simply laughing at a corny dad joke. Mack Weldon, a men’s underwear brand, used a well-known concept of “dad jokes”. Their email catches the reader’s attention with a stereotypical joke based on wordplay. But just when you are about to mock this not-so-funny pun, they add a bit of irony in the next sentence. Going in the opposite direction is gallows humor. This is a dark, fatalistic humor that skews negative. It doesn’t necessarily appeal to a wide audience, but if it appeals to yours they will appreciate your humor immensely. Here’s a great example is an email by Death Wish Coffee. 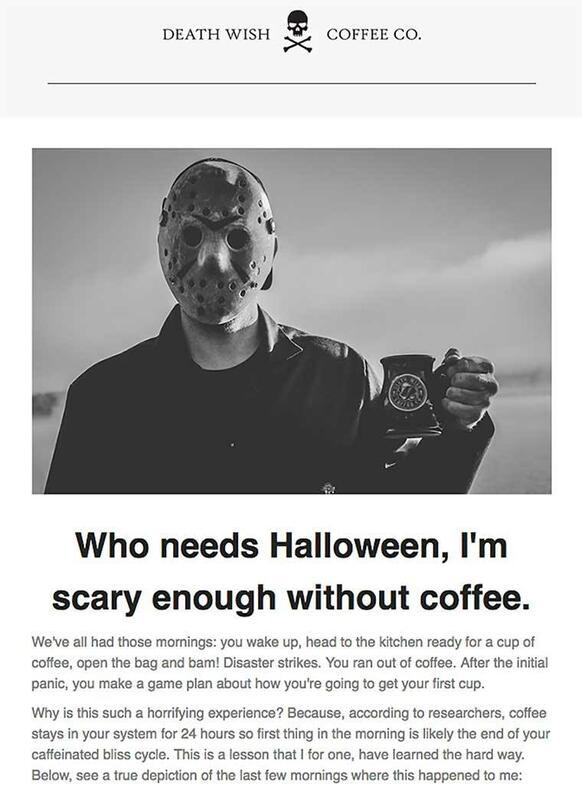 They used the popular main character from the horror series Friday the 13th and managed to identify him with themselves and their reader if they run out of coffee. 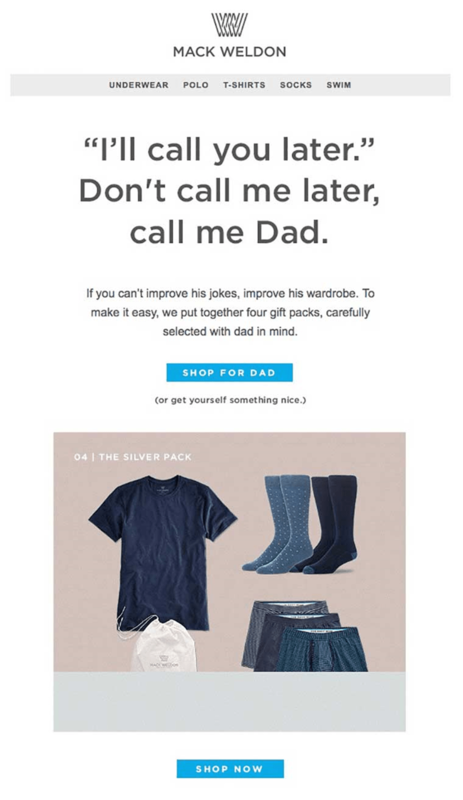 Using puns, portmanteaus, and other plays on words in your subject line and email content is a witty way to inject humor. Use it in a way that is relevant to your brand and products to get the best results. Flash Essay – For copywriting assistance, including email marketing content. Language Tool – A Chrome plugin and Google Docs add-on for checking your writing that works across multiple languages. Here’s an example from a rather unique brand Highway Robery that sells colorful kimono-style unisex robes. It has “A bit about kimonos…” as a subject line and explains how the founders of the brand came up with a specific style for their products. To convey this message and entertain their subscribers, the brand used humor. In addition to text, they’ve utilized several images and GIFs visualizing style options that the brand founders considered before creating their final design. 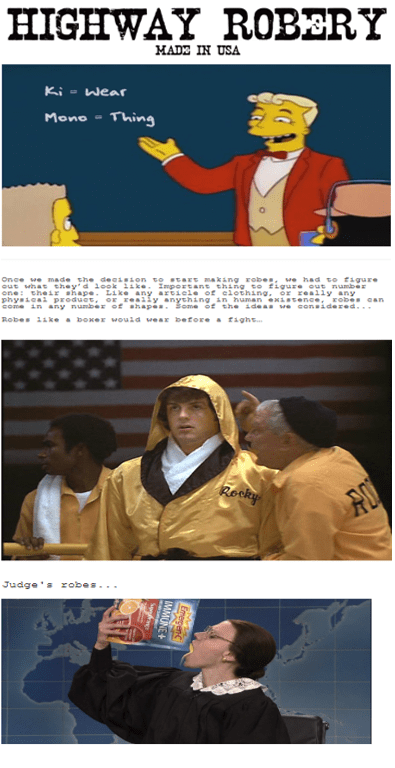 The result is an awesome email that represents a great example of how to combine humor and visuals. This technique can work but requires a judicious hand. Done correctly, it can appeal to the target audience’s desire not to be classified in a certain way. For example, a microbrewery might refer to people who drink mass produced beer as boring, corporate-swill drinking shlubs. It can also be used to take light-hearted swipes at readers. Wendy’s does this quite well over Twitter. I have no idea why I’m laughing at this. If you’ve ever found yourself giggling hysterically at some strange or absurd joke or image, you get absurd humor. You’re not alone. Brands like Old Spice use this humor in their commercials and online because it works so well. Pepper emails with random facts, absurd scenarios, and other silliness. For an example of absurdity used in marketing, see Old Spice. 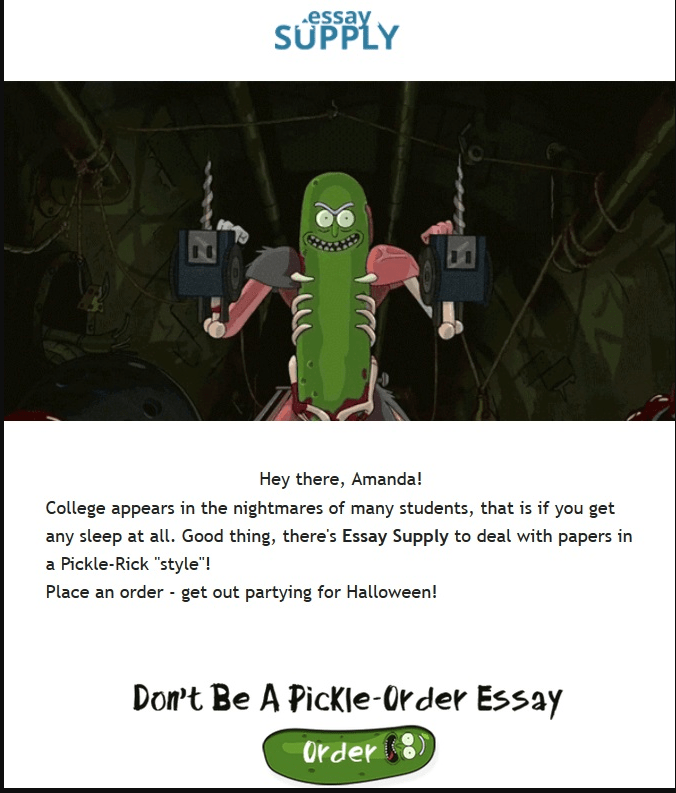 You can also check out this email that Essay Supply sent out during the last Halloween season. There are very few people who don’t appreciate the humor. Jokes can make your marketing emails memorable, and increase open rates and conversions. The key to success is matching the tone of your humor to your target audience. If you do that, your audiences might even begin looking forward to your name showing up in their inboxes.